The Costa Concordia’s dining room was full of guests as the first course had just been served as the wine glasses, forks, and plates were thrown crashing to the ground. The trash cans tipped over at the magic show in the theater. Then, the hallways were turned on their sides. Passengers had to crawl on bruised knees through the dark hallways as others jumped alone into the cold Mediterranean Sea. There were over 4,000 passengers and crew on the ship, which harkens memories back to the ‘Titanic’ disaster. The cruise ship ran aground just off the coast of Italy late in the day on Friday and flipped onto its side with a 160-foot gash in the boat’s hull. Three bodies were recovered almost immediately during the rescue efforts. On Saturday, rescuers found a couple from South Korea while performing a door-to-door cabin search for survivors. During the early stages of the rescue effort, there were almost 40 people unaccounted for. There are plenty of questions that still need to be answered including why were passengers told they were safe as the boat leaned to one side? Why weren’t the lifeboats released earlier in the accident? Why did the boat run aground off the coast of Italy? The boat van Dijk was on got stuck on one of the cruise ship’s side walls as it was being lowered to the water. “It was a hell of a sound, the crunching,” he said. 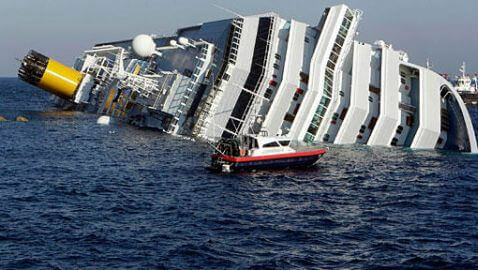 The captain of the ship, Francesco Schettino, was detained by authorities for questioning about the incident. He is being investigated for suspected manslaughter, abandoning ship before everyone else and causing a shipwreck. Two of the victims were from France and the third victim was Tomas Alberto Costilla Mendoza, a crewman from Peru. Close to 30 people were injured. “Have you seen ‘Titanic’? That’s exactly what it was,” said Valerie Ananias, 31, a schoolteacher from Los Angeles. Georgia Ananias was handed a 3-year-old daughter of an Argentine couple because they could no longer hold their balance as the ship listed to one side. As the rescue mission continued, divers found the bodies of two elderly men still wearing their life jackets. This raised the death toll of the accident to five while 15 people were still missing, including two Americans. Giglio residents said they have never seen the Costa come so close to the ‘Le Scole’ reef area, one of the most dangerous in the area. “This was too close, too close,” said Italo Arienti, a 54-year-old sailor said. The chairman of the Swedish Maritime Officer’s Association, Jorgen Loren, said that the captain deviated from the ship’s route and that it was very clear he did so. “It is remarkable because weather conditions were good and these cruise ships have the best and most modern technical equipment. All conditions were ideal,” he said. “These are well-known waters, ferries pass here every day going back and forward to the mainland,” he said.